Fresh pineapple and orange zest come together in this guacamole recipe for a fruity, tropical twist! 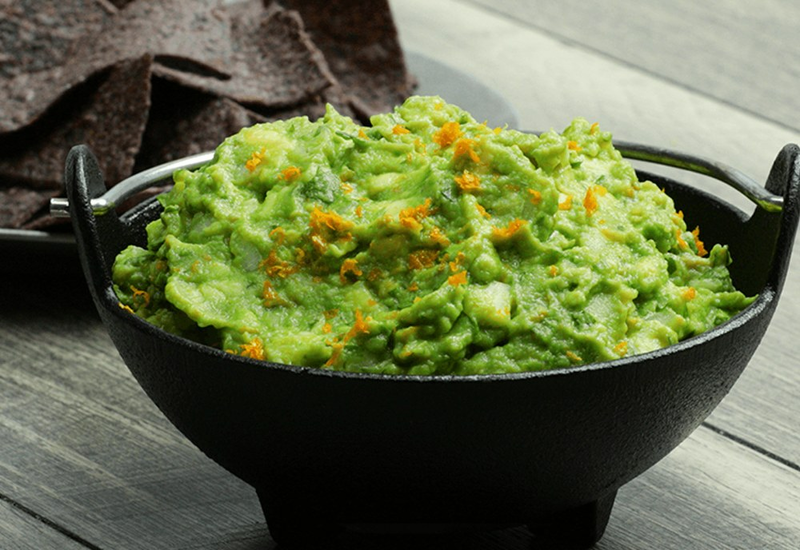 The orange zest adds a pop of color to traditional guacamole. Make a fruit-based salsa like our Watermelon Salsa or Tropical Salsa to keep with the tropical theme and serve with tortilla chips. Whip up a batch of fresh margaritas and you've got happy hour! Try other fruit zests like lemon or lime for another citrus flavor. Instead of pineapple, try small pieces of fresh mango for a different tropical twist. One clove of thinly sliced garlic will bring a savory element to this fruity version of guacamole. Freshly cracked black pepper could also add a nice spicy tone. Per Serving: 125 calories; 11g fat; 8.9g carbohydrates; 2g protein; 0mg cholesterol; 182mg sodium. I loved this guacamole, for those of us who eat guacamole a lot you MUST add some different flavors and this was a great example of that. For me pineapple goes really well with guacamole and with meat, carnitas or al pastor (pork) tacos. This has a really good taste to it and highly recommend it. What can I say, I'm a purist when it comes to my guacamole. I tried this but I don't love Pineapple in my guacamole. Serrano pepper certainly works for me and surprisingly the orange zest did too. I was hesitant at first, but so glad I tried this recipe. The pineapple and guac actually tastes great together. This is really good guacamole, with a twist. I loved the serrano and zested orange but found the pineapple a little odd. I love it in salsa, but not guac. I have had with pomegranate seeds before so I know it's not a 'purist' issue as mentioned before. I've made this recipe twice, the first time with pineapple and the second time with mango. I definitely prefer the mango over the pineapple. Especially when paired with the serrano pepper. It was like enjoying a really delicious mango salsa with guacamole.